The Ariens Deluxe 28 Snow Blower is designed as a top of the range residential snow blower or a mid range commercial snow thrower. It is powered by a 0.25 liter Briggs and Stratton Polar Force engine that is guaranteed to start even when it’s minus 20 degrees Fahrenheit (-28.9 degrees Celsius). This engine is so powerful that it enables the snow thrower to expel snow up to 15.2 m (50 feet) from the machine. How far snow is thrown is adjustable thanks to the deflector at the top of the chute. This machine is often also called the Ariens Deluxe ST28LE snowblower. The Ariens Deluxe 28 dual stage snow blower is started by either a 12o v push button, electric starter system drawing on electricity from the mains or you can start it using the recoil system. The fuel tank has the capacity to hold up to 2.7 liters of gas which will enable you to keep operating the snow blower for a few hours before it needs refueling. The 28 inch wide clearing face, breaks up snow using a serrated steel auger. This auger has a diameter of 0.36 m (14 inches) which then feeds the loose snow towards the middle of the ‘bucket’ before it’s sucked into the chute and expelled at high speeds by the impeller. The impeller consists of 3 blades and has a diameter of 0.36 m (14 inches). The Ariens Deluxe 28 snow blower uses a Disc-O-Matic transmission that is housed inside an extra strong aluminum transmission box. This give the machine 6 gears when traveling forward and 2 for reversing. Unfortunately the Ariens Deluxe 28 snow thrower does not have hand warmers, but at least it has a halogen light to illuminate the ground in front of it, so that you can operate the machine during darker hours. If you are looking for a machine that’s a little smaller, then check out the Ariens Compact 26 Snow Blower, but if you are looking for something bigger, check out the Ariens Deluxe 30 Snow Blower. 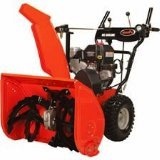 Click Here to buy the Ariens Deluxe 28 Snowblower.